Regionally grown American pale malt is blended with rich European malt to produce a lighter bodied beer, bright in color, with a taut white head. Then there are the hops - four pounds per barrel to be exact. Willamettes, Cascades, CTZ, and Summits give this brew a citrus punch and spicy character. Poured from a 12 oz. can into a goblet. A: Hazy, light amber color with one finger of white foam head. Light lacing remains on the glass and prolific yeast particles hang suspended throughout the column. S: Grapefruit is the dominant quality, although some biscuit is also detectable. Very clean, with plenty of volatile hops oils. T: Begins dry, with bright mixed citrus hops aromatics and fairly soft and refined pale malt. Acidity is assertive, yet well-matched to the bright fruity qualities. The middle sees the emergence of herbaceous spice and restrained crystal or Belgian aromatic malt chewiness. Bitterness is strong for the style in the finish, with ale esters that linger on the palate. D/O: This beer comes across as a dry-hopped Sierra Nevada pale ale might. Assertive but predictable, this APA is what West Coast-style IPAs were striving for some time in the past. Found this at Four Firkins in Minneapolis. I didn't notice at the store that the can was a bit past date--about two weeks past, as of today. We'll see how she held up. Poured the 12 oz can right from the fridge into my pint glass. L: Pours a light honey amber with about a half-inch of eggshell head that drops pretty quickly and leaves a film that sticks around and leaves a bit of cling. Moderate visible carbonation in this crystal-clear brew. S: Bright, fruity nose, with particular notes of apricot and citrus rind. Some other grassy hop notes above a cracker malt underside. Very pleasant and relatively assertive aroma. T: Not nearly as much fruit in the taste as there was in the bouquet. A subdued apricot/stone fruit flavor and some more assertive grapefruit rind over dry cracker malts. There's actually much more of the bitter rind flavor throughout the taste on this one. Even at the front, you begin to get that hop bitter at the sides and back of the tongue. The middle continues the grapefruit rind theme, with a bit of spicy/peppery quality coming through. The back end is hoppy all the way, with grapefruit rind leaving quite a bit of bitter. F: On the lighter side of medium-bodied, it feels a bit watery, but not to its detriment. Bright, smooth, effervescent, and decidedly bitter in turns. Clean-finishing, but not without bringing the bitter first. O: I'm a big fan of Indeed's brews, particularly their Let It Ride IPA. This one is somewhat reminiscent, in that it brings very big bright hop flavors all the way through the taste. With a relatively low ABV, this one drinks like bigger beers while remaining pretty easy to put away. Have to try to find this one fresher. Had on tap at the brewery and several places around town. Also had from a bottle and can. L: Pours brilliant gold, very rocky persistent 2” white foam cap. S: Floral herbal hops, spice light malt in the background. T: Starts full and malty, a touch sweet, and then the hops burst out, some orange, citrus, no grapefruit rind. Dries on the finish. F: Creamy, soft in the mouth, medium body. O: Very pleasant, hoppy pale ale. Smell - Tangerine / Orange rind and slight pale malts. 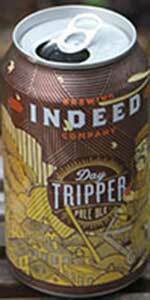 Overall - This is a tasty offering from Indeed but it is more like an IPA than an APA. Have had several times on tap; reviewing from can. A: Beautiful foamy, persistent head that takes forever to recede. Looks like either a nitro pour or beer drawn from a beer engine. Fantastic. An extra half-point for one of the best-looking cans anywhere. S: Hops dominate malt on the nose. Citrus and pine, plenty of grapefruit, maybe a hint of passionfruit. Smells great. T: One word: balance. As hoppy as it is, this is clearly not an IPA. The bitterness is held in check, despite what the aroma seems to promise. M: As expected from a beer of this style and strength, it is neither thin, nor heavy. O: This was the first beer I tried from Indeed, and it is one I will keep going back to. For a hop lover, it is ridiculously easy to drink several of these at a time. This will become one of the beers I routinely bring to other BAs when travelling. Lacing – good. Broken wide rings with tiny to large bubbles. This is more like an IPA than some of the IPAs I’ve had recently. Very dank with a long hang time. A - Pours a hazy darker orange with a large light tan foamy head with great retention. S - Hoppy strong oranges, some spices, pine. T - Orange and a touch of some hop bitter spice. Improves a bit as it warmed a touch. D - Thin with good carbonation. O - Hoppy pale with lots of orange and hop spice. Solid beer.